The media is applauding Health Minister Dr. Eric Hoskins this week for promising greater transparency around private clinic inspections that had previously been kept secret by Toronto Public Health and The College of Physicians and Surgeons of Ontario (TCPSO). Ontario’s Action Plan for health care includes systematically taking clinical services out of public hospitals and transferring them to a sector that has a history of two-tier medicine, questionable user fees, unnecessary up-selling, significant quality control issues and too little transparency. The latest revelations, particularly around infection control at several private clinics in Toronto, may have persuaded the government not to carry out spring and summer competitions for selected hospital clinical services – at least for now. They may have learned from the Ottawa Hospital’s ill-timed decision early in 2013 to divest 5,000 endoscopies to the private sector at the same time the TCPSO was making public the list of clinics that failed inspection public – including one Ottawa endoscopy clinic that may have exposed patients to HIV, hepatitis B and hepatitis C from equipment that may not have been properly sterilized. 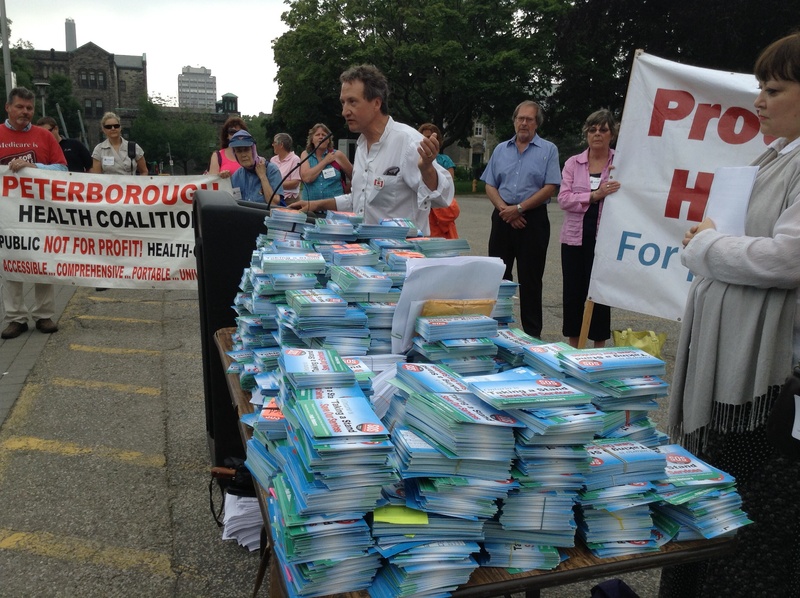 This spring the Ontario Health Coalition collected more than 80,000 postcards expressing opposition to the transfer of services from public hospitals to private clinics. Without any clear indication from government whether the competitions are on hold, the coalition is now working towards a November 21st mass rally in Toronto to push further on the issue. The end of efficiency – will appropriate care become the new system of rationing hospital services? Former OHA President Tom Closson speaking at Longwood’s Breakfast With The Chiefs June 10. The relentless pursuit of efficiency may be coming to an end for Ontario hospitals. This hardly means that hospitals are about to enter a new era of sustainable funding, especially in Ontario where public health care spending is already the lowest per capita of any Canadian province. Closson says Ontario hospitals also have the lowest worked hours per weighted case, the shortest length of stay in acute care, and the fewest beds per capita. Have we found bottom yet? Closson says we still have to reduce costs “because we have to.” Instead of seeking more efficiency, a new approach is needed. Closson was joined by the Hay Group’s Mark Hundert and Chris Helyar to preach the new orthodoxy of appropriateness and to suggest that the HBAM (Hospital Based Allocation Model) of funding needs fixing. Pat, we hardly knew you. A year after being appointed OHA CEO and President, Pat Campbell has mysteriously disappeared from the OHA. In a remarkably short announcement June 12, the OHA notes that its Board of Directors has appointed former Mike Harris aide Anthony Dale as their interim President and CEO effective immediately. It has been a rocky road for Campbell. This spring she looked less than stellar in responding to the CBC’s Rate My Hospital program. The same month former OHA CEO Tom Closson publicly disagreed with her interpretation of the Quality of Care Information Act after the Humber River Regional Hospital mistakenly declared a newborn baby dead and claimed the results of their investigation had to be kept secret. In May the OHA was uncharacteristically snippy about the provincial budget, complaining both about the lack of planning and the refusal of the Wynne government to rig the arbitration process in favour of the hospitals. Here’s a given – as Ontario hospitals start to shed services and staff in the next three years, the government is inevitably going to proclaim the benefits of serving patients in the community. The Canadian Institute for Health Information recently released a report showing Ontario has not only the fewest beds per capita in Canada, but the second least in the 34 country OECD (Organization for Economic Cooperation and Development). Only Mexico has fewer beds per capita – for now. In fact, the number of Ontarians hospitalized in 2010-11 was not only the lowest in Canada, but it was down 33.5 per cent from what it was in this province during 1995-1996. 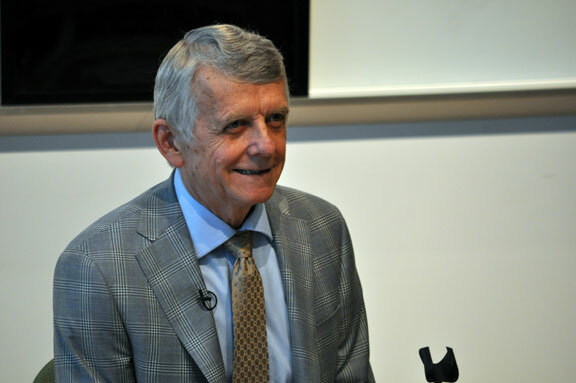 Tom Closson, the former Chair of the Ontario Hospital Association, told the Toronto Star June 22 that the province has lost 50 per cent of its hospital beds per capita over the last two decades. Ontario has just two beds per capita for every 1,000 residents. Foundation calls for more powerful LHINs – but how accountable will they be? Board members of the Local Health Integration Networks (LHINs) serve at the pleasure of the government of the day. They are appointed by Order in Council, and have a reporting relationship directly to the Minister of Health. There isn’t much direct criticism from the LHINs of government health care policies, including organization of the LHINs. Last week the Change Foundation issued a new report on integrated health care — Winning Conditions to improve patient experiences: integrated health care in Ontario. What’s significant is the Change Foundation report was reviewed by key players within the system, including Bill MacLeod, CEO of the Mississauga Halton LHIN. While the Change Foundation suggests the final report wasn’t necessarily endorsed by the reviewers, this is an organization that has some high level participation from key stakeholders, including former deputy minister Ron Sapsford, who sits on the Foundation board alongside departing Ontario Hospital Association CEO Tom Closson. How transparent is data from Ontario’s hospitals? And does it really tell the true story? In July the far right Fraser Institute took a shot at Ontario hospitals claiming they lacked transparency when it comes to reporting performance indicators. The Ontario Hospital Association shot back, claiming the Fraser Institute was likely unaware of www.myhospitalcare.ca –an OHA site that provides data on more than 40 performance indicators. The release quotes OHA President Tom Closson as saying Ontario’s hospitals are among the most accountable in Canada. The question is: how does Closson come to that conclusion? Is the OHA web site intended to be the evidence to support such a claim? It’s true that there is a lot of public information on hospital performance, although what gets reported varies from hospital to hospital, the manner in which it is reported is often difficult to understand, and the information is usually less than timely. The information is also in different places. Some of it is on individual hospital web sites. A select number of indicators are on the OHA site. Wait times information is on a Ministry of Health web site. To complicate matters, the information reporting dates are not the same on these sites, leading to conflicting data results. It is also not unusual to see wild swings in the information reported, leading to questions about the quality of the data. If you look up the Niagara Health System (NHS) on the OHA’s site, the infection rate for C-Difficile is similar to many other hospitals, although above the provincial average. That may have something to do with the fact that the data was collected in February of this year. Similarly, the Hospital Standardized Mortality Rate for the NHS is above average but below many other peer hospitals. These numbers don’t tell the real story – the Niagara Health System has recorded 37 C-Difficile-related deaths this year – so far. In the age of real-time technology, is it reasonable for the public to try and make decisions based on data that is often more than six months old? The OHA specifically cautions about using standardized mortality scores in determining which hospital to go to, instead suggesting such data should be used to track the performance of the hospital. What’s the point of standardizing such scores if they are not meant for outside comparison? At the Local Health Integration Network board meetings, explanations over how to interpret this data are frequent. Yet the public is expected to go to web sites and understand such concepts as compliance with pre-surgery antibiotics, percentage of near miss reporting, or how inpatient weighted cases are determined. Could there not be at least a glossary and some explanatory notes to go with this data? Try and decipher this reported action on the Peterborough Health Center web site: “Monitor and review VAP and CLI cases, rates and compliance with Safer Healthcare Now! Bundles.” Reading this, I’m sure the public can sleep more soundly now. Clearly there is a need to provide a more simplified overview that puts this data into a more meaningful context. Often data is hiding in plain site – on some hospital sites there is so much of it, finding what you are looking for is a considerable challenge on poorly organized web sites. The myhospitalcare web site does provide provincial averages, but it does make it difficult to look at comparisons without going to each specific hospital location on the site. Closson’s pronouncement of Ontario’s transparency ignores the fact that the province is the last to bring hospitals under Freedom of Information legislation. Ontario hospitals finally come under the Freedom of Information and Privacy of Privacy Act in 2012, but the OHA successfully fought to bring in additional exemptions for quality information as part of this year’s budget bill. In fact, the broad-based wording of the exemption will allow hospitals to conceal considerable information from prying eyes looking for public accountability. Curiously, the OHA recently posted its advice to hospitals about the upcoming FIPPA deadline. You need a login and password to read it. 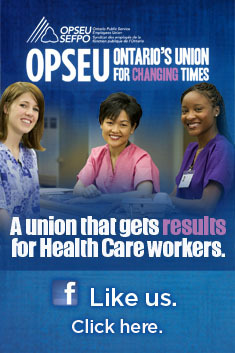 Ontario is also the last province in Canada to open up public hospitals to the scrutiny of the ombudsman. This is one office that has the expertise to cut through the dense jargon OHA members use in their reporting and to demand the data that isn’t publicly posted. Last October Osler, Hoskin & Harcourt LLP raised eyebrows when they sent out an information bulletin warning hospitals that they should be “cleansing existing files on or before December 31, 2011, subject to legislative record-keeping requirements.” Osler was warning Ontario hospitals that they could face the same kind of reputation risk as e-Health if they failed to do so. While there was shock and dismay, nobody knows to what extent Ontario hospitals took that advice to heart. It is interesting that Closson used the word “accountable” and not “transparent” in the OHA’s defense. Clearly there is a way to go for hospitals to be transparent in a truly meaningful way.